Phase 4 has launched. Last week we told you about Facebook’s new “everyone button” that lets users who have chosen to keep their profiles at least partially private send the occasional status message or other content out to the public. That feature, which goes hand-in-hand with the recent search engine for public status messages, launched today to a small number of users. Don’t be fooled by what appears to be a minor change in the user interface. This is another indication of Facebook’s extreme desire to get users to make as much of their data public as possible. Just like Twitter. This new version of Publisher lets users add content such as photos, videos, and status updates on your home page and profile. Each piece of content can be shared with everyone, friends and networks, friends of friends and friends. Users can also customize the settings further. 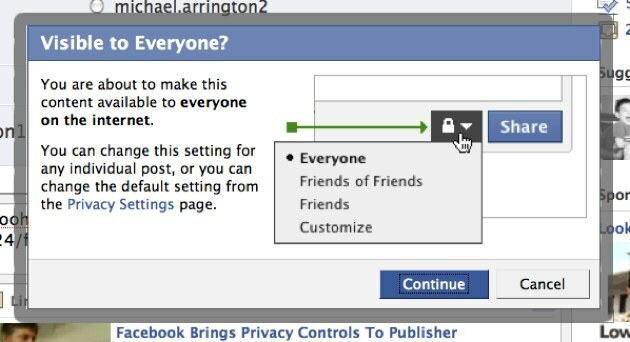 You can now control who you want to inform of your Facebook friends when you add any kind of content to the site. Here’s how it works: After writing a status, uploading a photo or creating other content from the Publisher, use the lock icon in the lower-right corner of the Publisher to access the drop-down menu. From there, you can then choose to make the post visible to everyone, friends and certain networks, friends of friends, and a custom list.